ww2dbaseThe Allied forces landed in the southern portions of mainland Italy in Sep 1943, and the subsequent progress had been slow, largely due to a fairly well-executed delay action campaign conducted by the Germans, anchored on several prepared defensive lines. By Dec 1943, the Allies had reached, but could not penetrate, the Gustav Line situated south of the Italian capital city of Rome. 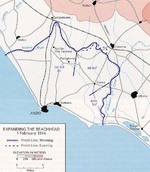 To speed up the advance, Winston Churchill ordered the British commanders to present a plan for a two-division amphibious assault at Anzio, Italy behind the Gustav Line. As the plan developed, the Agro Pontino, an area of reclaimed marshland near Anzio and Nettuno, was chosen as the landing area. Major General John Lucas was selected as the commander of what was to be named Operation Shingle. Lucas felt that it was an extremely risky undertaking; he feared that the force assigned to him was not large enough, and thought that the invasion "has a strong odor of Gallipoli". ww2dbaseOperation Shingle commenced on 22 Jan 1944, landing 36,000 men and 3,200 vehicles by the end of the day. Opposition was minimal on the first day, and Allied casualties were low; the Allies suffered 13 killed and 97 wounded, while 200 Germans were captured. British 1st Infantry Division had moved 2 miles inland, US 3rd Infantry Division had moved 3 miles inland, US 6615th Ranger Force had captured the port of Anzio, and US 509th Parachute Infantry Battalion had captured Nettuno. Having established a beachhead with relative ease, rather than advancing toward Rome to potentially force the Germans to divert forces from the Gustav Line or advancing toward Gustav Line itself to link up with the Allied forces in the Cassino area, Lucas chose to remain in place in order to strengthen the beachhead against a possible German counterattack. ww2dbaseOn the German side, Field Marshal Albert Kesselring reacted quickly. At 0500 hours, he ordered mobile units from German 4th Parachute Division and Hermann Göring Panzer Division to rush to the area to cover the roads leading out of Anzio, while he requested his superiors in Germany to reinforce Italy with men from rear areas. Later in the same morning, he ordered General Eberhard von Mackensen of German 14th Army and General Heinrich von Vietinghoff of German 10th Army to dispatch their reserves to reinforce the Anzio region. By the end of the day, he had come to the realization that the Allies had no intentions of a quick breakout from the region. Through 24 Jan, Kesselring had gathered over 40,000 men in the area. Four days later, he gave the order to strike at the earliest possible moment. Despite of Lucas' initial lack of aggressiveness, however, he would be the one to attack first, launching a two-prong attack on 30 Jan; US 3rd Division advanced toward Cisterna and then the Alban Hills beyond, while British 1st Division advanced toward Campoleone; both would fail to achieve their objectives. In the afternoon of 3 Feb, the German offensive began with probing attacks, followed by a full attack at 2300 hours. By the following day, the Allied front lines were beginning to falter near Campoleone, with several units becoming surrounded by German troops. After several days of heavy artillery exchanges, at 2100 hours on 7 Feb, the Germans launched a new round of attacks. 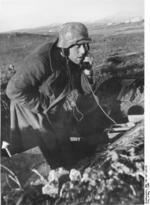 On 11 Feb, the Allies launched a counterattack, but it was met with failure as the Germans had intercepted the radio communications, and thus was able to prepare against it. On 16 Feb, the Germans launched Operation Fischfang, pushing the Allies dangerously close to the beach, but a carefully timed counterattack using forces held in reserve halted the German advance by 20 Feb; in these four days alone, the Allies suffered 3,500 casualties at Anzio and the Germans 5,400. On 22 Feb, Lucas, whose performance had disappointed Harold Alexander and Mark Clark thus far, was relieved, replaced by Lucian Truscott. Although Truscott was entrusted to launch the all-out offensive that Lucas failed to do, such an attack would not take place until many weeks later. In the mean time, the Germans reinforced the lines at Anzio with two Italian divisions fighting under the SS banner; on the other side, the Allies brought in US 34th Infantry Division and later US 36th Infantry Division and replaced British 5th Infantry Division with British 56th Infantry Division. ww2dbaseBy mid-May 1944, Allied strength at the Anzio beachhead reached 150,000 men (two British divisions and five US divisions). At 0545 hours on 23 May, 1,500 Allied artillery pieces bombarded German lines for 40 minutes, thus commencing a new Allied attempt at breaking out of the Anzio beachhead. The main assault toward Campoleone, Velletri, and Cisterna was conducted by US 45th Infantry Division, US 1st Armored Division, and US 3rd Infantry Division, which were guarded by German 362nd Infantry Division and 715th Infantry Division; the first day of action was costly on both sides, but the 50% casualty rate suffered by the two German divisions would prove to be fatal. On the left flank of the main assault, British 5th Division and British 1st Division advanced up the coast, pinning down German 4th Parachute Division and German 65th Infantry Division. On 25 May, US 3rd Division captured Cisterna, nearly wiping out 362nd Infantry Division in the process, and advanced into the Velletri gap near Cori. Meanwhile, at Valmontone, US 1st Armored Division engaged German Herman Göring Division. At the end of the day on 25 May, Clark ordered Truscott to turn US 1st Armored Division north toward Rome, leaving only US 3rd Infantry Division and supporting units to continue the attack on Valmontone; Clark would not inform Alexander of this maneuver until the following morning. Truscott had doubts about this order, as he believed that if given more time he could have taken Valmontone and inflict very heavy casualties on the defending Germans, but he would obey his new orders. On 30 May, after seven German divisions successfully withdraw along Route 6 in Italy, Kesselring allowed his troops in the Velletri gap to slowly fall back from this area. On the same day, US 36th Infantry Division began penetrating the German Caesar C Line; it would be overrun by 2 Jun. Hitler saw no reason to hold on to Rome, and expressed such sentiment to Kesselring on 2 Jun, who agreed whole-heartily, preferring to move his surviving forces to reinforce defensive lines further north. Two days later, US troops marched into the Italian capital. Clark immediately held a press conference on the steps of the Town Hall on the Capitoline Hill in the same morning in an attempt to secure himself as the victorious general, purposefully understating British participation while doing so. 18 Dec 1943 The plan to land several divisions at Anzio, Italy was briefly canceled. 22 Jan 1944 36,000 Allied troops landed at Anzio, Italy, facing little opposition. 23 Jan 1944 The destroyer HMS Janus was lost off Anzio, Italy. 24 Jan 1944 German forces in the Anzio, Italy region increased to over 40,000 men. 25 Jan 1944 General Eberhard von Mackensen assumed overall control of forces in the Anzio, Italy area. 27 Jan 1944 To the west, Allied Major General John Lucas by now commanded 70,000 men, 237 tanks, 508 heavy guns, and 27,000 tons of supplies at Anzio, Italy, but he decided to still maintain a defensive posture. 28 Jan 1944 German Field Marshal Albert Kesselring ordered a counterattack against the Allied beachhead at Anzio, Italy. 29 Jan 1944 Total Allied strength at the Anzio, Italy beachhead totaled 69,000 men, 508 guns, and 208 tanks by the end of this day. On the other side of the lines, German strength rose to 71,500 men. 30 Jan 1944 Allied forces attacked out of the Anzio, Italy beachhead, advancing toward Cisterna and Campoleone, but none of the two forces would be able to capture the objectives; during the process, an entire US Army Ranger battalion was destroyed. 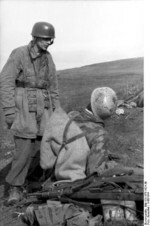 2 Feb 1944 Germans defeated American troops in the Battle of Cisterna near Anzio, Italy. 3 Feb 1944 The American attempt to break out of the Anzio beachhead in Italy was halted, followed by the first German counterattack against the beachhead. 4 Feb 1944 German troops penetrated Allied lines at the Anzio beachhead in Italy. 5 Feb 1944 German and Allied artillery pieces bombarded each other at Anzio, Italy. 6 Feb 1944 German and Allied artillery pieces bombarded each other at Anzio, Italy. 7 Feb 1944 German and Allied artillery pieces bombarded each other at Anzio, Italy; at 2100 hours, Germans launched a full attack on the beachhead. 9 Feb 1944 German troops captured Aprilia, Italy. 10 Feb 1944 Winston Churchill wrote to Harold Alexander, urging him to order the field generals at Anzio, Italy to be more aggressive. 11 Feb 1944 Major General John Lucas ordered a counterattack from the Anzio beachhead in Italy, which was repulsed by the Germans which had intercepted Allied radio communications and had prepared for this attack. 13 Feb 1944 Americans stopped a German counter attack at Anzio, Italy. 16 Feb 1944 The Germans launched Operation Fischfang, throwing 7 divisions against the Allied beachhead at Anzio, Italy. On the same day, Harold Alexander inserted Lucian Truscott and Vyvyan Evelegh under Major General John Lucas in an attempt to alleviate Lucas' poor performance at Anzio. 18 Feb 1944 The Germans made progress at Anzio, Italy, but were finally beaten back by artillery and naval gunfire. 20 Feb 1944 The Germans called off Operation Fischfang aimed at the Allied beachhead at Anzio, Italy. 21 Feb 1944 Three Italian motor torpedo boats attacked the Allied beachhead at Anzio, Italy, damaging USS PC-545 and USS Pioneer before dawn. 22 Feb 1944 Mark Clark replaced John Lucas with Lucian Truscott at Anzio, Italy. 23 Feb 1944 Three Italian motor torpedo boats attacked the Allied beachhead at Anzio, Italy before dawn, causing no damage and losing two boats. 24 Feb 1944 Two Italian motor torpedo boats attacked the Allied beachhead at Anzio, Italy before dawn, causing no damage and losing one boat. 25 Feb 1944 Five Italian motor torpedo boats attacked the Allied beachhead at Anzio, Italy before dawn, causing no damage and suffering no losses. 29 Feb 1944 The third major German offensive was launched at Anzio, Italy, which would again fail to dislodge the Allies. 1 Mar 1944 Three Italian motor torpedo boats attacked the Allied beachhead at Anzio, Italy before dawn, causing no damage and suffering no losses. 3 Mar 1944 Three Italian motor torpedo boats attacked the Allied beachhead at Anzio, Italy before dawn, causing no damage and suffering no losses. During the day, the Germans called off the attacks on the beachhead. 9 Mar 1944 One Italian motor torpedo boat attacked the Allied beachhead at Anzio, Italy before dawn, causing no damage. 14 Mar 1944 One Italian motor torpedo boat attacked the Allied beachhead at Anzio, Italy before dawn, causing no damage and suffering no losses. 19 Mar 1944 Italian motor torpedo boats attacked the Allied beachhead at Anzio, Italy before dawn, engaging in brief combat. 22 Mar 1944 Four Italian motor torpedo boats attacked the Allied beachhead at Anzio, Italy before dawn, causing no damage and losing two boats. 24 Mar 1944 The Anzio beachhead in Italy was subjected to heavy German artillery and guided bomb attacks. Out at sea, an Italian motor torpedo boat attack sank one cargo ship; one Italian boat was sunk in the attack. 29 Mar 1944 Two Italian motor torpedo boats attacked the Allied beachhead at Anzio, Italy before dawn, causing no damage and losing one boat. 13 Apr 1944 Italian motor torpedo boats claimed the sinking of an Allied corvette off Anzio, Italy; this sinking was not confirmed. 20 Apr 1944 Italian motor torpedo boats sank British landing ship LST-305 off Anzio, Italy. 27 Apr 1944 Italian motor torpedo boats attacked the Allied beachhead at Anzio, Italy before dawn, causing no damage. 5 May 1944 Harold Alexander ordered for the preparation of Operation Buffalo, which called for an assault on Cisterna, Italy; Mark Clark, however, would modify this plan so that he could strike at Rome, Italy. 13 May 1944 Allied troops captured Ponte Sant'Angelo and Castelforte, Italy. 16 May 1944 British fusilier Frank Jefferson used a PIAT anti-tank launcher to destroy a German Panzer IV tank along the Gustav Line in Italy, which led to his unit repulsing a German counterattack which was spearheaded by the tank. He would later be awarded the Victoria Cross for this action. 19 May 1944 British troops captured the airfield at Aquino outside of Rome, Italy. 20 May 1944 US Fifth Army captured Gaeta, Italy. 23 May 1944 Three US and two British divisions launched a new assault out of the Anzio, Italy beachhead at dawn, inflicting heavy casualties on German formations but also suffering similarly. 24 May 1944 US forces captured Terracina, Italy. 25 May 1944 US 3rd Division captured Cisterna, Italy after house-to-house fighting, nearly wiping out 362nd Infantry Division in the process; nearby, US 1st Armored Division engaged German Herman Göring Division at Valmontone while US Fifth Army troops linked up with the Anzio contingent. At the end of the day, Mark Clark ordered Lucian Truscott to turn north toward Rome without informing Harold Alexander. 26 May 1944 After US 1st Armored Division had already been ordered north toward Rome, Italy, Mark Clark belatedly reported to Harold Alexander such a change in orders; he left only 1 division to attack the remaining German forces at Valmontone. In the area, US troops captured Cori. 29 May 1944 US 1st Armored Division engaged German defensive positions of the Caesar C Line south of Rome, Italy. 30 May 1944 British troops captured Arce, Italy; US 36th Infantry Division penetrated between German 1st Parachute Corps and LXXVI Panzer Corps on the Caesar C Line. Also on this day, after seven German divisions successfully withdraw along Route 6 in Italy, Albert Kesselring allowed his troops in the Velletri gap to slowly fall back. 1 Jun 1944 British troops captured Frosinone, Italy. 2 Jun 1944 Allied forces overran the German Caesar C Line south of Rome, Italy; Adolf Hitler ordered Albert Kesselring that the Italian capital would be abandoned. 3 Jun 1944 Albert Kesselring declared Rome, Italy an open city. 4 Jun 1944 Mark Clark and the US 5th Army entered Rome, Italy unopposed; Clark immediately held a press conference on the steps of the Town Hall on the Capitoline Hill. Some fellow Allied generals thought Clark had failed to trap the German 10th Army. Nearby, the Italian motor torpedo boat base at Terracina was evacuated. The italian campaign was a conquest, not a liberation. Italy was part of the axis, therefore there was no occupation force, hence the conquest. I have many article and pictures of my dad that servided his country during the second world war, his blanket and spoon he ate with, his song book and many religious pictures he had in his wallet. some have stains of blood, while he helped his fellow troops. For italians that was Liberation: the end of war and the end of fascism. the articale is ok but could use a bit of improvement and their was more than 6-7 paragraphs about this campaign and what happened in it. I WOULD NOT RECOMMENED THIS SITE FOR RESEARCH FOR HISTORY PROJECTS AT ALL. Seeking any info on Jim Hildebrandt KIA in Anzio Italy 2nd Rangers Thank You. General Lucas and his boss General Mark Clark failed to show the initiative George Patton would have. They remained on the beachhead consolidating their position and landing supplies instead of capturing the heights beyond that were held by a weak German force. Lucas was fired for his passive inactivity and Clark should have been. Uncle served from Anzio through Rome, up the Po River valley to just before Berlin. The last of his unit was sent home. Coincidence: on the way north from Rome he passed through the village that the parents of his sister's husband came from. "25 miles north of Rome". At 94, he cannot remember the name of the village. His sister's kids cannot remember the name of the village. I'm doing family research and trying to find the name of that village. Any guesses? My uncle Irvin F. Vest was a kia at Anzio I am trying to find out what Army unit was with or any other imformation. My great grandfather was a seabie who fought in the battle of Anzio. Richard your granddad could've saved my great grandfather! Greetings! Does anyone have specific information on Battery B 10th Field Artillery 3rd Div at Anzio? ... movements, positions, etc. Dad (Edgar) was with that battery from N Africa through the wars end at Berchtesgaden. Thank you! Researching Anzio for a school project. Very helpful, thank you! My uncle Cpl. GILBERT STEPHEN MANTOSH, Royal Air Force, was on board the HMS LST 305 with several RAF personnel operating a ship based Radar, which was then in an experimental stage, in preparation of D-Day. HMS LST was torpedoed by U-230 off the coast of Anzio 0n 20th February 1944 and NOT on 20th April 1944. Eight RAF personnel, including my uncle were killed. Any details of these RAF personnel will be appreciated. My email:rmantosh@vsnl.com. Thank you. My father Pvt Robert Warren, Company D, 157th Infantry, who was a heavy machine gunner, was wounded on 31 May 1944. Would someone have information on where the company was on or near this date as well as a description of the fighting taking place? Possibly on the road to Nettuno. Thank you! My daddy, Bill Lowery, was a rifleman in the First Balttalion, 133rd Infantry, 34th Division. He fought at Anzio until May 20 when he was wounded during an attack by his Battalion beyond the Mussolini Canal near Cisterna. Twelve men in his “B” Company died during the attack with many wounded. The 133rd Infantry narrative history records that Company “B” was forced into a withdrawal as the German counter-attack was extremely lethal. Following two months in the foremost front line positions on the Cisterna front, the merciless Battle for Anzio was over for daddy. Like every other veteran of this hellish battle, it affected him for the remainder of his life.